1- Important missing word has been found: "Gunless"
There is a hue and cry from our own government, the "news" media and too much of the public to quickly try and punish, even execute, the battle-scarred U.S. soldier accused of killing Afghan civilians. His motives are unknown. His mental state is unknown. His guilt is undetermined. He claims his memory of the event is hazy. In contrast, the muslim U.S. Army Major who murdered 13 unarmed American soldiers on his own military base, and wounded 29 others, in front of countless witnesses, while screaming muslim battle cries, two-and-a-half frickin years ago, is being coddled, tested, evaluated, clothed and fed, in a virtual news blackout, and has not stood trial. The military has finally set his trial date for June 12, 2012. His motive -- kill infidels -- is known and unquestioned. Anyone who attributes this insanity to the debilitating and destructive left-wing program of political correctness (we're bad, they're good, mea culpa) may have a point. Thanks to the anonymous emailer who got me thinking about this. The mysterious honeybee die off could end pollination and the entire planet could starve to death. Ooops, still here, no correction issued. The deadly H1N1virus has the potential to be a major pandemic and you could be doomed. The deadly HantaVirus has the potential to be a major pandemic and you could be doomed. Avian bird flu is spreading rapidly and there's no known cure, you could be doomed. A deadly E. coli outbreak of a new drug-resistant strain threatens life as we know it. The food stamp program, part of the Dept. of Agriculture, is pleased to be distributing the greatest amount of food stamps ever. People dependent on government will vote for their providers every time. Certain Americans should start carrying No-Gun Permits. you can get a card that says you have official permission to not carry a gun. you must declare that you are unarmed, and you must show your permit. Failure to have or show the permit is an additional charge. 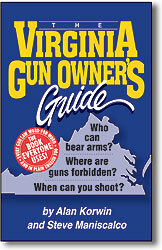 secured No-Gun Permits. It's only fair. It provides equal protection under the law. Gratuitous gunlessness is a pox on society. You just can't beat Bill Whittle, boy is he ever good. It is voltage divided by current (R=V/I). You must treat email and all web postings as a direct line to authorities, who not only can monitor anything you say, they can mine data from you over past years. I have a ton of material on this point. They do it now, they want to get better at it, and they will. The people we elect or hire for public service should be screened for latent or overt gun hatred, and disqualified if such hatred is found, before it can do any more harm than it has already done to our nation and its values. Thanks to all of those who answered my call for a term to describe people who choose to reject personal ownership of firearms. Those numerous suggestions, ranging from silly to sarcastic to serious, led me to an answer. • In other words, if the ten-to-one ratio of armed people (estimated at 100 million) to criminals (estimated at about 10 million) suddenly shifted so armed criminals outnumbered armed citizens and they had the ten-to-one advantage, would that be good or bad? National Training Week is when everyone is encouraged to go to the range and practice during 4th of July week (July 4 - 11). 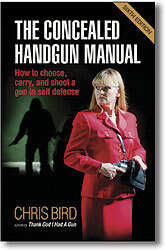 https://www.gunlaws.com/NationalTrainingWeek.htm. "Celebrate the 4th of July with fireworks, firearms and freedom." Wouldn't it be nice if, as a special project, your own local shooting ranges offered one-hour handgun rentals for free, so you could try out new guns? Wouldn't the week of Independence Day be a nice time to do that? Sort of, celebrate your freedom with fireworks and firearms for the 4th of July. Ranges nationwide could make the offer, throw in special classes even for newcomers, and America would be better for it. I'm trying to help make that happen. We've been working this for four years now. new business, revenue, new customers. You can help me make it happen. Take a look at the plans for National Training Week, when everyone is encouraged to go to the range and practice during 4th of July week (July 4 - 11). 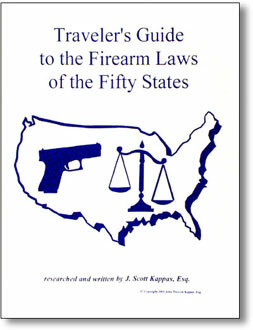 https://www.gunlaws.com/NationalTrainingWeek.htm. "Celebrate the 4th of July with fireworks, firearms and freedom." Let my good friend Bill at the National Shooting Sports Foundation (NSSF) know that you support the idea of National Training Week. Ask them to support it too. A Hispanic volunteer neighborhood watchman shot a poor little unarmed black child to death, and he had the unmitigated gall to claim Florida's recent Stand Your Ground law let him commit the murder with impunity and no repercussions. This has inflamed all Americans, as it should, and especially the black community, and especially the black people and people of all colors in Florida. Such a terrible law has been passed in many Neanderthal states, according to the unbiased Associated Press. From the Florida "news" reports, it sounds like this guy stalked and gunned down a helpless little youngster. If that were true, there's no way he could be protected by law. There is no way he would not be charged. If on the other hand, this kid posed a genuine and serious threat to life or limb, which the survivor claims, then of course the use of deadly force to protect yourself from the criminal assault would be legally justified, historically and culturally normative, and righteous and moral by any standard. If that's true, then the universal news tone that this bigot murdered this poor innocent child, would really be, the neighborhood watchman stopped yet another murderous young black thug in the midst of a felony assault. We don't know yet, and the pictures of the kid are so cute, so why let facts get in the way of a good story. Guilty before facts are even known. The "news" reports did also mention in passing that the person who claims he defended himself against the black youth was bloodied about the head, but that's such a small detail it should have little play in this tale. Life is a precious gift, and it is to be protected from unwarranted attack, whether four-legged, two-legged or other. All of this is completely regardless of the no-retreat law the media has mysteriously latched onto. The recent rash of stand-your-ground laws are, to a large degree, a response to anti-gun-rights prosecutors who in the past have used any excuse to go after otherwise righteous and innocent people, just because they exercised their right to arms. In those cases, the prosecutors are the ones who belong in prison. Harold Fish, here where I live, spent 3-1/2 years in prison, and spent $700,000 in his self-defense case, and he was innocent. That should not be allowed to happen. Government should at least pick up legal costs when it loses a self-defense case -- meaning you should never have been charged in the first place. This would also help deter politically motivated or agenda-driven charges, which are widely known to occur. I plan to draft such language. Some legislators have introduced legally suspect laws that require you to abandon your home rather than protect it, or run away from where you have a right to be. That's always an option, and often the best one, but it certainly isn't something the state can legitimately require, granting all power to criminals and denying it to the public. Freedom is hollow if you can't stay where you have a right to stay. Even without a no-duty-to-retreat law on the books, the immediate defense of innocent life, when necessary, is a right we all have, and should have, and is inherent in our very nature. The right to legitimately defend yourself should be honored by any court (assuming you have a good lawyer, plenty of money, a proper prosecutor, in a good jurisdiction, with ascertainable facts, and no contrary witness testimony from the perp's buddies, and cops who responded properly, and a benign face... the list is endless). Arizona has the finest gun laws in the nation. Our self-defense statutes are particularly robust and protect the innocent while being harsh on criminals. If we can find out what actually happened in this incident, we could intelligently apply our laws to see what would have happened here. If this white Hispanic male was criminally attacked by a black or by a white black or by a person of any color or color mixture, and he survived by his own hand, any law in the land should protect him. If he killed this youngster without cause, no law in the land will protect him and he could face death. That's what you call good law. We have the needed laws. They're good. I can almost feel the antis brainstorming and gearing up to use this wholesome self-defense case (or heinous murder, as the case may turn out to be), to force new laws on us. The proper laws are already there, and justice will be served. Dancing in the blood of criminals (or victims, as the case may turn out to be), to get new anti-rights laws enacted, would be despicable. But no surprise. Late breaking news (3/26/12): A leaked police report indicated today that the youngster was the aggressor, but the "family" denies this (and was not present to witness); evidence shows the youngster instigated the assault, which the "family" denies (and was not present to witness); the leaked report indicates the youngster had been suspended from school, and may have been high, and the family knew this, but the family says this has no bearing; CNN indicated the news should have never been revealed, but since it has, the world has to deal with it; CNN added that the search is on for the person who released these facts, and if found will likely face dismissal, to which CNN voiced no objection, probably because it was not a CNN leak source, which are highly honored. EVEN LATER BREAKING NEWS: Images you have been treated to by the lamestream may not be accurate according to reports on the unreliable un-federally regulated (yet) Internet. media reports to the contrary. The person shot is the perpetrator. AND FINALLY [memo paused to add this note in the midst of transmission]: There is now some question as to whether the images above are who they claim to be. Apparently, Drudge, Michelle Malkin, Massad Ayoob and others were "fooled," but it is not clear yet if the pictures are good or not. 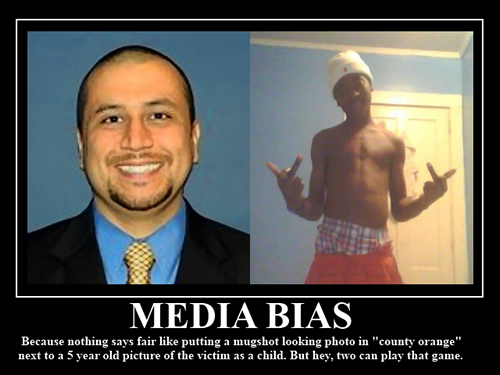 One report suggests it is a different Trayvon Martin, and other claims are flying. I'll get to the bottom of this, and if I have erred, I will of course make that clear. For now, the clever image above is like the Colbert Report. Florida has a self-defense law the rest of the nation needs badly. If you "win" a self-defense court trial you're put in the poor house by the "justice" system. Costs can typically run into six figures. Do you have that kind of money? Kiss your house goodbye. That's not a win. And that's not justice by any rational definition. If you prevail in a self-defense trial, which basically means the state should never have charged you at all, and you did their job by stopping or eliminating a violent felon, the state should be liable for your legal bills. The idea that you deserve a medal or a parade is too radical for the moderate Uninvited Ombudsman. "Loser pays" is not some wacky new principle of law. It is a well established and just practice in civil cases. Not only does it make you whole again -- and this is key -- it is a serious deterrent to the state to go after you in the first place. It would eliminate many of the marginal attempts to incriminate people for defending themselves against truly bad actors. Two states already have such protection, Washington and Florida. 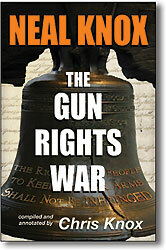 Arizona, which constantly comes up with the best gun laws in the nation, should be next. I'm working on it. You should too, for your state. Arizona's controversial publicity-hungry Sheriff Joe Arpaio, the self-proclaimed toughest Sheriff in America, has staged a publicity stunt over the completely resolved issue of Mr. Obama's birth certificate. Backed by "birthers" from the "tea party," and responding to a "birther" demand to investigate -- against overwhelming evidence that no wrongdoing exists -- the controversial Sheriff bowed to "birther" conspiracy-theory demands and staged the show. More than 50 news outlets attended the press conference, and left only with tales of who accused who of what, and redundant reports that Obama's righteous Justice Dept. is investigating the controversial Sheriff. "Birther" has become the new "N" word for the media, used with dripping hatred for anyone who dares ask questions about Mr. Obama's falsified birth certificate. Where facts do not exist, the media hurls epithets, a classic sign of bigotry. "The only thing missing from today's Arizona Republic story about Sheriff Arpaio's investigation into Obama's controversial birth certificate was... news. The reporter provided plenty of charges and accusations, a lot of he said she said, finger pointing and sordid old history, but no actual news. What were the findings? Good journalism would require that in the lead. It wasn't covered at all. I hope some of the rest of you reported on that. Why did Arpaio say the birth certificate is suspicious? It didn't even get mentioned in passing. Six months of investigation, 2,000 hours of work, one hour of news conference, not a single word on the news! Please give us the facts in your next edition [they did not]. I cannot believe reporting has fallen to such a low that not a single word about what the irregularities actually were made it into print, and editors didn't notice. It's no wonder people have lost faith in the "news," because there isn't any." Read the report yourself. The irregularities and obvious evidence of tampering are plain to see. The media are collectively hiding the truth and attempting to derail any effort to expose this deception. CBS -- "investigators believe that the long form birth certificate was manufactured electronically and that it did not originate in the paper format as presented by the White House." Many reports quoted this single line from Arpaio. The other more frequent quote: his six-month investigation had found that "probable cause exists indicating that forgery and fraud may have been committed" in the release of President Obama's long-form birth certificate. None of the reports followed up on that devastating breaking news. Arpaio's press conference puts him in league with the "birthers," the conspiracy theorists who claim - against overwhelming evidence - that Mr. Obama was not born in the United States and thus is not eligible to be president. (CBS). What about the evidence of forgery? "Layers: A normal scan is a flat file and does not contain multiple layers. The Obama PDF contains 9 layers and grouped to a clipping mask layer." The "sudden difference in background color/pattern is another inconsistency that could NOT happen if the document was simply scanned with no further manipulation and released by the White House -- but this inconsistency would only happen if the White House document is a manufactured file." Detailed images and explanations are in the report. Joe Arpaio is a sworn Sheriff. He enjoys the highest approval ratings of almost any elected official in the state. He plans to continue the investigation despite the "news" media's complete failure to accurately report or follow up on this tremendous story. "Their predetermined desire to discredit me and my office would not even allow them to consider listening to what was presented..."
In what seems like a mistake and breach of protocol that pundits say could bring the wrath of corporate down on their heads, a CBS-TV affiliate in Phoenix broadcast a segment on the forged Obama birth certificate that recognized the weight of the evidence that could support criminal charges. The report states that direct evidence of the forgery was found, it is posted on the internet, and the ID of the computer that generated the falsified document is known. The report also found evidence of a coverup by Hawaiian officials, where the original document is said to exist but is not available for direct review, according to CBS. No further information has been revealed. The report however did fail to recall that John McCain, who ran against the current occupant of the White House, was brought before a Senate committee and required to testify and prove that he was a citizen elligible to run, since he was born at the Panama Canal. Mr.Obama has been under no such requirement, but at least his eligibility is tremendously controversial. "I was at the press conference yesterday and the lamestream media, finally there en mass to hear the findings, were like rabid dogs afterward who didn't give a crap about the Cold Case Posse's findings that forgery and fraud had been committed. All they cared about was whether it was politically motivated, while other morons asked questions about the DOJ and its charges of racism against Arpaio, which was not the subject of the press conference. "They obviously don't give a rat's a-s about the facts of the matter because it interferes with their agenda. I think their behavior afterward is almost as much of a story as the preliminary findings by the Cold Case Posse. "Quite frankly, Alan, those people who consider themselves "journalists" scared the sh*t out of me yesterday. Not that they didn't before, but being that close up and personal showing how agenda driven they are really shed a bright light on it." The Arizona legislature looks ready to pass, and governor Brewer seems ready to sign, a bill to allow hunting with legally owned silencers. Yet another wild idea from our state capital, hunting with silencers is unsporting and unfair to game, since it gives them no warning, according to hosts on KFYI-AM 550 radio. Americans buy more than 27,000 silencers each year according to SilencersAreLegal.com. In its effort to promote the economy and help provide jobs, the federal government delays the purchase of silencers by as much as 120 days or more, to handle the paperwork, on top of the $200 tax per item. If you cannot imagine any private business operating like that, and staying in business, you're not alone. In Europe and other developed countries, using silencers for hunting or at the range is considered an important health issue, since it protects hearing, and required in some jurisdictions. In France, where modulators (the British term) are not required at the range, they are considered a courtesy to other shooters. 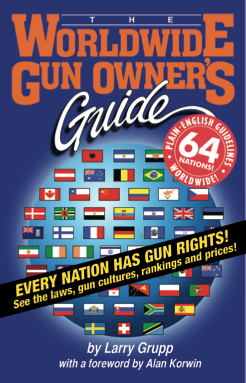 See The Worldwide Gun Owner's Guide for more worldly gun info. If OSHA was doing its job, it would help make modulators widely available, for the beneficial health aspects they provide. If modulator sales tracked firearm sales, the one million or more units monthly would be a tremendous economic stimulus. National police figures show the number of robberies involving knives rose from 13,971 in 2010 to 15,313 last year, despite the overall number of crimes recorded by police falling by four per cent to 4.1 million, figures showed today. In a report that surprised no one in the U.S., crime with knives has increased in Great Britain, which has a virtual ban on firearms for the public. Handguns are essentially impossible to obtain, and long guns for hunting are strictly controlled and constantly monitored. The report by the Telegraph, pointing out a decrease in overall crime, didn't refer at all to the criminal switch to knives, with guns so much harder to obtain. They also failed to point out that, with a population of 62 million, the chances of being a victim in a knife or other crime is only 1 out of 15, not very good for a nation touted as safe thanks to its gun-free approach to fighting crime. According to the report, "Chief Constable Jon Murphy, the lead for crime for the Association of Chief Police Officers, said... 'This has been driven by a rise in robberies of personal property and police forces will want to focus actions on tackling these offences and offering crime prevention advice.'" We can only hope that they're crime-prevention advice is, like, really really good. When California's government-run gun-transfer bureaucracy crashes, it prevents any guns from being transferred or shipped into the state for the day. No apologies are made. Any business lost is lost. Martin Luther King Jr. day had this honor recently. Because California Department of Justice (DOJ) must control everything, their California Firearms Licensee Check Program (CFLCP) must issue a Firearm Shipment Verification Approval Letter (FSVAL) to any Federal Firearms Dealer (FFL), all of whom must be enrolled in the California's Centralized List of Firearm Dealers (CCLFD). Since the CDOJ's CFLCP requires the FSVAL for any CCLFD registered FFL to proceed, dealers and customers on MLK Day were SOL, a SNAFU, but AOK now. This may not be clear because it is FUBAR, OK? In California, this is considered acceptable management of your rights. Thanks to Chuck Michel at CalGuns for the details. http://www.examiner.com/gun-rights-in-st-louis/void%280%29/%2a249%2a/ --Martin Luther King Jr.
My computer system just sent me a note that you joined my email alert list. Might I ask how you found us, and what prompted you to join? Nothing wrong, just trying to keep track of things. Thanks. Alan. 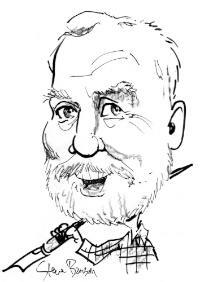 "When all things lead to one point, (Google, Gun forums, Del Mar Gun Show) there is either something there to laugh at, or learn from, and me, I like to learn, as close too the source as possible. Thus you. Thank you for what you do."